Arabic is one of the most difficult languages in the world to learn, but with a little bit of help from these 7 awesome resources you’ll be well on your way in no time. Whether you’re learning Modern Standard Arabic or a dialect, written or spoken, subject-specific or conversational Arabic – this list of books, apps and programmes will save you time, effort and stress – hamdullilah! Al Kitaab is like Marmite – you either love it or you hate it. 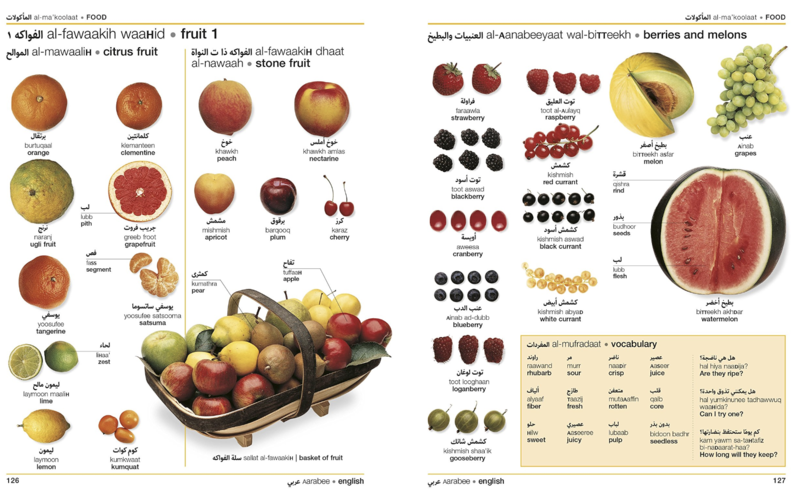 Either way, it’s a classic and is by far the most popular Arabic textbook for learning Modern Standard Arabic (i.e. MSA or fusha). Each chapter starts with a list of vocabulary and a video story from Maha and her family (if you’ve studied with Al-Kitaab before, you’ll be all too familiar with poor Maha’s dramas). The books also slowly introduce you to Arabic history and culture as you go along. The vocab covers a wide-range of topics and the grammar sections are as clear and concise as they can be. The only drawback would be that the vocab isn’t particularly useful for day-to-day interactions (e.g. “where is the bathroom?”, “I’ll have two plates of falafel please”, etc. ), so if you’re focusing on spoken Arabic or a specific dialect then they may not be so useful. However, if you’re learning to read and write then the Al-Kitaab books are an essential resource for students of any level. This book is super practical and will help you with day-to-day vocabulary for everyday life (so basically everything Al-Kitaab won’t help you with!). It introduces collections of vocabulary in thematic order using full-colour photographs to label virtually object you can possibly think of, from food and office supplies to body parts and modes of transport. It also fits nicely in your handbag, so you can take it out and about. This is an awesome resource that I recently discovered which makes it super easy to read online articles and websites in Arabic, translating vocabulary on the go. It’s a simple plugin for your web browser that allows you to click on a word and see the translation appear instantly above it. Before I found Readlang, I would open Google Translate in a new tab and flick between tabs every time I came across a word I didn’t know, so this has saved me so much time and hassle! It’s super easy to use and is free for translating individual words, although if you want to translate longer phrases you’ll have to upgrade and pay $5 a month. This collection of books edited by Oxford Professor Elisabeth Kendall is incredibly helpful if you’re interested in current affairs. There are four books in the series: Media Arabic, Security Arabic, Intelligence Arabic and Internet Arabic. These easy to use, almost pocket-sized books contain all the vocabulary you’ll need to know if you’re following the Arabic media – and particularly if you’re interested in politics and security. Natakallam is a programme connecting language learners around the world with refugees who can work as speaking partners and teachers. Not only is it a great way to practice conversational Arabic wherever you are in the world, but you’re also providing economic empowerment for vulnerable people and fostering friendships across borders. I highly recommend Natakallam if you’re looking to practice and improve your spoken Arabic, as they offer various different dialects and can focus on topics that suit you. And if you’re a complete beginner, they also have a curriculum integrating MSA for a little more structure. They say you shouldn’t judge a book by its cover, but in this case your perceptions are probably spot on – it’s a bit of a beast. But if you’re studying a more advanced level of Arabic – and particularly if you’re studying translation – this bad boy is about to become your new best friend. Words are listed according to their root [quick Arabic lesson – most words are derived from a root, i.e. usually three or four consonants that convey a basic meaning, and are arranged into a series of patterns to form different verbs, nouns and adjectives with similar meanings). This is by far the most comprehensive English-Arabic dictionary I have come across and is recommended by many universities. It trumps online dictionaries like Google Translate every time, and is particularly useful for finding obscure vocabulary. Memrise is a handy app for learning vocabulary on the go. Think of it as interactive flashcards, incorporating audio and video to help you learn. It offers various different exercises and a ton of vocab categories and collections – perfect for learning on the go or when you have a few minutes to kill. You can also set daily goals for yourself and create learning groups and courses with your friends. So there you have it – 7 essential resources to make your Arabic learning journey less of a headache! We hope you’ve found this list useful. If you have any thoughts or would like to suggest other useful Arabic resources, please leave a comment below or email us at thepinkjinn@gmail.com – we’d love to hear from you!